4Easysoft Nexus One Video Converter provides you with the best solution to convert any video such as HD videos, SWF, FLV, VOB, MOD, MP4, H.264, M4V, AVI, WMV, 3GP, 3GPP, MOV, DivX, XviD, QuickTime Video, DV, MJPG, MJPEG, MPV, MPEG, MPEG2, MPG, etc. to Nexus One MP4, 3GP, AVC, AVI, MPEG-4, etc. format. Also with this conversion tool, you can extract audio from any video and convert audio to Nexus One audio format. 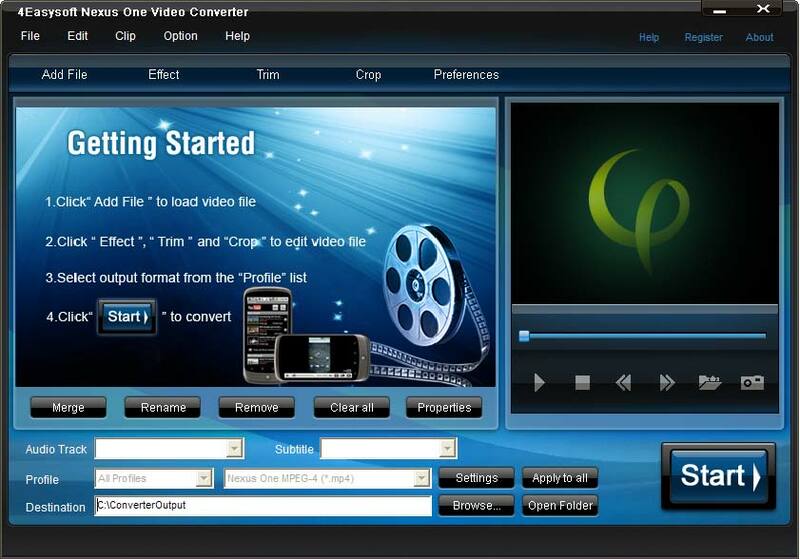 To get customized video, 4Easysoft Nexus One Video Converter also provides you with rich and powerful editing functions, such as video trimming, video cropping, video merging, video watermarking and video effect adjusting. With an intuitive interface, this software is suitable for both beginners and advanced users. This 4Easysoft Nexus One Video Converter deserves your trust. Set several different output formats from source file(s) and convert it (them) to different formats simultaneously. You can preview the source and target video through the built-in player, and capture the image of highlight while previewing. It can be saved in default folder automatically. With the help of 4Easysoft Nexus One Video Converter, you can adjust video brightness, contrast and saturation to get customized video. Also it can help you convert an interlaced video to a progressive one through the function of “Deinterlacing”. 4Easysoft Nexus One Video Converter enables you to trim any segment of a video as you want through dragging the slide bar or just setting its start and end time. Also you are able to crop frame size to remove the unwanted playing areas to fit your Nexus One. You can merge video and audio pieces together. Moreover, you are allowed to add a text/image watermark to your video and set its position and transparency. Video settings: Video Encoder, Resolution, Frame Rate, Video Bitrate. Audio settings: Audio Encoder, Sample Rate, Channels, Audio Bitrate. And you can save all these output settings as the user's defined profile. 4Easysoft Nexus One Video Converter can finish your task in the least time compared with the similar software in the market.